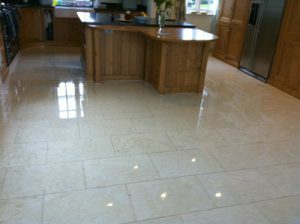 Travertine is a natural stone material from the limestone family. It is made of calcium carbonate and is usually found in the form of deposits near warm or hot springs. It was frequently used in ancient times as a building material. Because travertine is such a porous material, it should be sealed before use in construction or renovation projects. It is most commonly used for countertops and flooring, but may also be used in showers and tub surrounds as well as in exterior decor. One might think that since stone can withstand the ravages of weather and outdoor elements, it is unlikely to be damaged when used in the home. Aside from its obvious beauty, durability is one of the elements that lead people to choose natural stone for home building and home improvement projects. 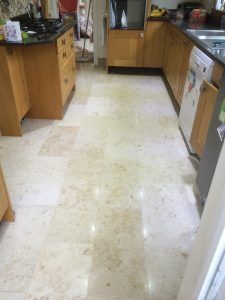 The truth is that unpolished travertine is highly susceptible to heat, scratching, staining and acidity, including citric acid, so it should only be cleaned with special products designed for use on natural stone.